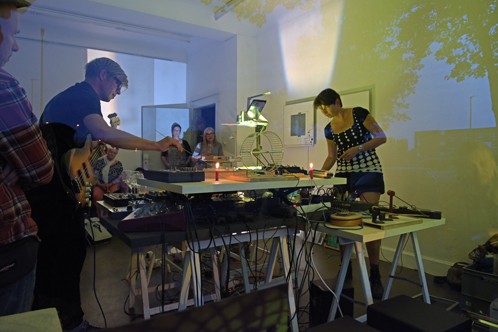 This audio visual Show is a new collaboration of Cologne-based media artist Tina Tonagel and the Arnhem musician Pierre Estourgie. Together they develop a range of selfmade mechanical Instruments, analog projections and automatically controlled devices.The result of the combination with Synthesizers are imaginative soundscapes, subtile rhythms and a surprising room ﬁlling adventure. 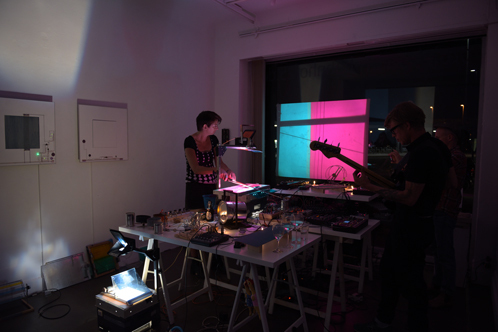 Tina Tonagel works with sound, various projection techniques and electromechanical devices, which she uses for interventions in space. Through her work she sharpens the image and perception of the spectator for spatial peculiarities and seemingly everyday things. The poetry of precise elaborated aesthetic and understandable mechanic makes her work to a fascinating experience. Tina Tonagel has received numerous scholarships and prizes and her work was shown in various exhibition and festivals. Pierre Estourgie specializes in (acoustic) electronica sounds and music. All sounds are handmade and self produced with samplers, analog synthesizer and effects which he plays live. His composities are recognized the feeling for detail, authentic choices and cinematic atmosphere. Pierre Estourgie plays his tunes live in different multidisciplinary collaborations, festivals and solo. Performance by Tina Tonagel "Himalaya Variationen"
audiovisuelle Performance mit zwei Overheadprojektoren und selbstgebauten Instrumenten. In ihrem Solo-Projekt Himalaya-Variationen nutzt Tina Tonagel zwei Overheadprojektoren als analoges VJ-Tool. Die Leuchtflächen der Projektoren bespielt sie mit einem experimentellen Instrumentarium aus E-Gitarren-Elementen, rotierenden Scheiben, Kugelbahnen, Klangwerken einer Uhr, Lochblechen und Motoren und kombiniert die manuelle Klangerzeugung mit automatisierter Mechanik. Das Klangspektrum vereint subtile Klänge mit vielschichtigen Rhythmen, während in der Projektion durch die Überlagerung der zwei Bilder und die direkte visuelle Übersetzung der Klangerzeugung ein fulminantes Farb- und Lichtspiel entsteht, das die Grenzen zwischen Bild und Musik verschmelzen lässt.